Transport company FirstGroup has extended its deal with the government to run services on the Great Western rail network until 2019. 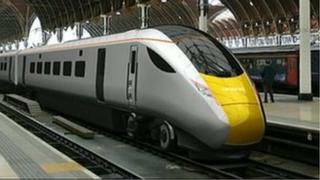 The new franchise covers a period in which a series of upgrades will take place along the Great Western network. Those improvements include electric train services for the first time on the network, starting with services in the Thames Valley. Upgrades will also include additional train capacity at peak times. First Great Western will pay the government about £68m to operate the franchise - which operates services between London, the Cotswolds, South Wales and the South West - from September 2015 until April 2019. The Department for Transport (DfT) said passengers would benefit from the addition of three million extra seats across the network by 2018. It also said more services to Devon and Cornwall would be added to the timetable, and 369 new train carriages introduced to the network. The DfT added that capacity during the morning rush hour commute to London would increase by 4,000 seats by December 2018. FirstGroup will also be responsible for introducing the new Hitachi Intercity Express Trains between London, Bristol and South Wales and the Cotswolds from summer 2017. FirstGroup chief executive Tim O'Toole said the rail operator was already working with the DfT and Network Rail to deliver the initial phases of the £7.5bn Great Western mainline modernisation programme. The franchise award was long expected. FirstGroup is the longest serving of the train operating companies. In 1996, it joined a bid for one of the first railway franchises of the privatisation programme, which began under John Major's Conservative government. It has operated the Great Western network on its own since 1998 when it took 100% ownership of the franchise.